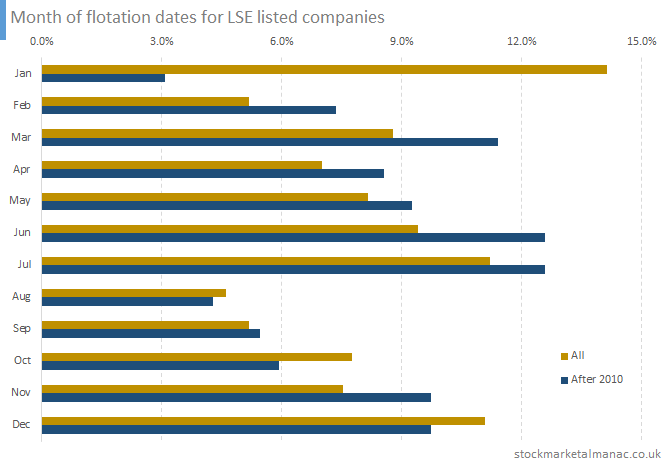 The table below shows the monthly frequency of company flotations (IPOs) and listing on the London Stock Exchange. The dark bars show the month frequency for all flotations of companies currently listed on the LSE, and the lighter bars are limited to just the 162 companies floated from the beginning of 2010 to 2015. As can be seen, the most popular month for flotations has been January, 14% of all flotation took place in this month. The second most popular month has been July (11%). By contrast the least popular month is August, followed by February and September. This profile has changed somewhat in recent years. Since 2010, the two busiest months for flotations have been June and July (13%), followed by March. And, oddly, January is now the least popular month for flotations (3%). The following chart plots the performance of an equally-weighted portfolio comprising the 162 companies that floated 2014-2015. For reference, the FTSE 100 Index is also shown. It is not a pretty sight. 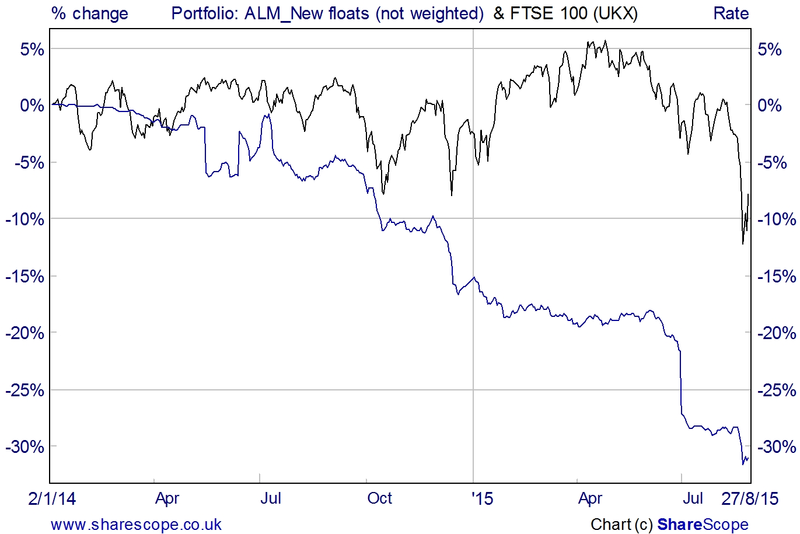 Since the start of 2014, the FTE 100 Index has fallen 8%, but the Flotation Portfolio has declined 31% in value. Extract taken from The UK Stock Market Almanac 2016. Order the newly published 2017 edition of the Almanac.